Gonos, E.S., et al. Ceramic Textiles from Mineral Oxides Microfibers Coating (Nanobionic®) Efficiently Emit Infrared Rays and Reduce Free Radical Levels in Healthy Volunteers and in Patients with Free Radical-Related Disorders. (2016) J Med Chem Toxicol 1(1): 1- 7. © 2016 Gonos, E.S. This is an Open access article distributed under the terms of Creative Commons Attribution 4.0 International License. Nanobionic® are mineral based and bio-ceramic coating on microfibers clothes based on newly developed high-tech textile. Previous studies have shown that use of these vests has positive effects on athletic performance; however, the mechanism of function remains unknown. In the current report we provide evidence that these clothes have a high energy emission up to 99%, giving it the most positive results of emitting infrared rays. Moreover, we demonstrate that mild use of Nanobionic® clothing (2 hours/day for 6 days) reduce free radical levels in peripheral blood mononuclear cells (PBMCs) in two-thirds of healthy volunteers ranging from 9.13 to 95.38%. Given these findings we have also examined Nanobionic® clothing effects on a pathophysiological condition that is linked to oxidative stress and free radicals, namely, Raynaud syndrome which is a rare blood disease. Importantly, we have recorded a significant increase in hands’ temperature in these patients. In conclusion, this report demonstrates the beneficial effects of Nanobionic® vests in reducing free radical levels in healthy individuals as well as in patients suffering from free-radical-related disorders. Recent studies have resulted in the development of innovative clothes using pioneering materials of high technology able to absorb the human body’s thermal emission and transform it into Far Infrared (FIR) radiation. Few positive effects on human health have been reported on the usage of FIR. For instance, ceramic-emitted FIR was found to increase the resistance of murine macrophages to different concentrations of H2O2 and to block ROS-mediated cytotoxicity[1,3]. Reactive oxygen species (ROS) are continually generated as by-products of a number of cellular processes and are also produced when the cells are exposed to various external stimuli such as ultraviolet light, ionizing radiation and various environmental cytotoxic substances. These unstable and reactive derivatives can cause damage to biological macromolecules such as lipids, proteins and nucleic acids. A wide range of age-related diseases such as Alzheimer’s disease, Parkinson’s disease, dementia and diabetes are associated with free radicals. The materials used in Nanobionic® clothes are based on polyurethane loaded with mineral oxides (bio-ceramic) coated on a microfiber (patent pending) whose potential beneficial health effects remain to be documented. An independent study has shown that polycarbonate-urethane textiles (PCU; Bionate®) may have beneficial effects in heart disorders. Moreover, a preliminary report has shown that use of these vests has a positive effect on athletic performance by improving anaerobic power parameters during exercise. Given these findings in this report we have examined the effects of using the above mentioned material to the levels of endogenous free radicals in healthy volunteers as well as in patients suffering from a free-radical-related disorder. &emspTo verify the effect of inclusion of bioceramic material in the Nanobionic® products, an optical characterization was done first. Seven Nanobionic® products were chosen and samples of suitable dimensions were extracted from them for measurements. The radiance (W/m2•λ) was measured for all the samples in the IR wavelength extending from 4 to 14 μm, which is suitable for the application on human body[9,10]. The measurement system consisted of a spectrometer with a MCT/A detector, sensitive from 0.8 to 35 μm provided with a software-based control. This measurement system was aligned and calibrated in the spectral range extending from 4 to 14 μm. The calibration was done by a homemade source of radiation, which simulates a black body source at the temperature of 37°C. This element was maintained at fixed temperature by a thermostatic system whose temperature controller had been tested before the measurements. The same heating element was used as oven to warm the samples. Emission spectra were then recorded for each sample kept at the temperature of 37°C. Effect of polyurethane loaded with mineral oxides (bio-ceramic) coated on a microfiber fabric on the ex-vivo production of Reactive Oxygen Species (ROS) in peripheral blood mononuclear cells from healthy volunteers: Twenty-four volunteers having a normal body weight and distribution of their anthropometric data (10 women and 14 men; mean age was 49 years for females and 57 years for males) were included in the study. The study was conducted in accordance with The Code of Ethics of the World Medical Association (Declaration of Helsinki) and informed consent was obtained from all volunteers involved. All subjects were firstly asked to donate blood (25 ml) by phlebotomy after overnight fasting and then they were asked to wear the polyurethane loaded with mineral oxides (bio-ceramic) coated on a microfiber clothes (Nanobionic® vest and Nanobionic® socks) for various time periods ranging from 2 - 3 hours/day for one week to 8 hours/day for one month. Following this procedure, volunteers were separated into four groups based on frequency of Nanobionic® use. The first group included 6 persons (aged 47 - 70, 4 male and 2 female) who wore the bio-ceramic clothes 8 hours/day for 30 consecutive days, the second group included 8 persons (aged 23 - 65, 5 male and 3 female) who wore the bio-ceramic clothes 8 hours/day for one week, the third group included 4 persons (aged 35 - 66, 1 male and 3 female) who wore the bio-ceramic clothes 5 hours/day for one week and the fourth group included 6 persons (aged 31 - 77, 4 male and 2 female) who wore the bio-ceramic clothes 2 - 3 hours/day for one week. Blood samples were also collected for each group after the end of each period and oxygen reactive species (ROS) were measured in peripheral blood mononuclear cells (PBMCs) before and after Nanobionic® intervention (see “Measurement of intracellular Reactive Oxygen Species” section). Effect of polyurethane loaded with mineral oxides (bio-ceramic) coated on microfiber clothes on Raynaud disease: Fourteen persons were used in this study. From those 10 were suffering from primary Raynaud’s, 5 females and 5 males with ages ranging from 12 to 68 years. Four persons were suffering from secondary Raynaud’s due to collagen diseases from Rheumatoid arthritis (2 patients) and scleroderma (2 patients). From these 4 patients one was male of 72 years and 3 were females with ages ranging from 46 to 62 years. All tests were performed in normal temperature conditions (18 - 20°C) using a digital thermal imaging system (Meditherm Inc). Patients were examined before and after the use of Nanobionic® gloves for 20 min. “Blind tests” were performed in separate sessions by wearing good quality (merinos) gloves. Peripheral blood mononuclear cells (PBMCs) isolation: Peripheral blood mononuclear cells (PBMCs) were purified from freshly drawn blood, with EDTA as anti-coagulant. For the separation of PBMCS we used Percoll PLUS (GE Healthcare, Little Chalfont and Buckinghamshire, United Kingdom) gradient centrifugation. Briefly, 25 ml of whole blood was separated in plasma and haematocrit (via centrifugation at 300 g for 15 min at room temperature) and the latter was diluted 1:6 with PBS. Plasma samples were finally obtained by centrifugation at 2000 g for 10 min at room temperature. The diluted haematocrit was layered on the top of 15 ml Percoll solution and centrifuged at 800 g for 15 min at room temperature in a swing-out rotor without break. Mononuclear cells harvested from the gradient were washed by re-suspension in PBS and centrifugation at 200 g for 15 min at 4°C. Measurement of intracellular Reactive Oxygen Species: 2′, 7′-dichlorodihydrofluorescein diacetate (H2DCFDA, Molecular Probes, Invitrogen and Carlsbad, CA, USA) was used for detection of reactive oxygen species. 105 PBMCs in total were re-suspended in PBS ± the dye at a final concentration of 10 μm loading buffer and incubated at 37°C for 30 min. The loading buffer was then removed; cells were re-suspended in pre-warmed PBS and incubated at 37°C for 5 min. The absorption and emission of the oxidation product were measured at 493 and 520 nm, respectively. Each sample was measured in quadruplicates. The radiance was measured in 7 different samples (Sample n.1: T-shirt, sample n.2: vest, sample n.3: black socks, sample n.4: blue socks, sample n.5: stockings, sample n.6: brown socks and sample n.7: black and white socks) following the procedure mentioned above. A measurement of radiance was taken for each sample in 3 different days. The spectral radiance and the emissivity resulting value averaged on the three measurements from the T-shirt sample are reported in (Figure 1) (A. Emission Spectrum of T-shirt; B. Emissivity as a function of λ of T-shirt. For the other samples, see: (Suppl. Figure). The results show that all Nanobionic® samples have very high emissivity. In particular in the 4 - 14 μm wavelength interval has been measured an emissivity between 95% and 99 % that is very near the emissivity of a black body at the same temperature. To our knowledge this is the only product that results in such a high emissivity. Figure 1: Measurements of radiance for T-shirt sample. A. Emission spectrum at T = 37°C and B. Emissivity as function of λ. Supplementary Figure: Measurements of radiance for a set of Nanobionic® samples. Measurements of radiance for samples 2 - 7 (2: vest, 3: black socks, 4: blue socks, 5: stockings, 6: brown socks, 7: black and white socks). A. Emission spectrum at T = 37°C and B. Emissivity as function of λ. In a pilot experiment the volunteers have used clothes based on polyurethane loaded with mineral oxides (bio-ceramic) coated on a microfiber for various time periods ranging from 2 hours/day for 6 days to 8 hours/day for 30 consecutive days. Optimum data were found in those volunteers who have used the clothes for 2 hours/day for 6 days (data not shown). Based on these conditions (2 hours/day for 6 days) we have determined free radical levels in PBMCs in these individuals. We found that 15 subjects (62.5%) had decreased levels (58.7% on average; overall range of reduction from 9.13% to 95.38%) of free radical species in PBMCs after bio-ceramic clothing use (Table). Table 1: Healthy volunteers’ and Raynaud’s syndrome patients’ response following Nanobionic® clothing use. Raynaud’s disease is an ailment of the blood vessels usually in the fingers and toes. It causes the blood vessels to narrow when the extremities are cold or the subject is feeling stressed. Raynaud’s phenomenon is common with rheumatic diseases (systemic sclerosis, systemic lupus erythematosus, primary Sjögren’s syndrome, mixed connective tissue disease etc), occlusive vascular diseases, hematologic disorders, use of vibrating tools and rarely with malignancy. In all persons wearing the Nanobionic® gloves reacted similarly in the 20 minute follow-up study after wearing gloves and showed reestablishment of normal peripheral circulation in the fingers with normal temperature gradients (Table). In support, immediately after thermography investigation was completed, Doppler ultrasonography was performed showing increased flow in the arteries perfusion (data not shown). Moreover, it is worth noting that the temperature in wrists has not been affected by wearing the Nanobionic® gloves as there was no dysfunction in this area. (Figure 2A) shows a typical case of the baseline image of the thermal evidence of significant peripheral circulatory dysfunction with a loss of normal blood flow in the fingers of both hands. The 20 min follow-up study wearing the Nanobionic® gloves showed a reestablishment of normal peripheral circulation in the fingers and normal temperature gradients (temperature raised from 36.2 – 36.4°C to 36.6 - 36.7°C) (Figure 2B). In summary, the findings indicate that the application of polyurethane and bio-ceramic microfibers gloves substantially improves the local circulation in patients affected by Raynaud disease. Figure 2: Thermographic estimation of hands with Raynaud’s syndrome. 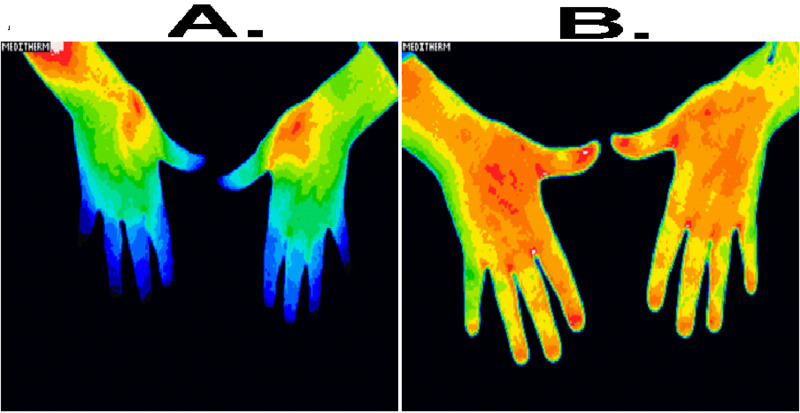 Thermographic estimation of hands with Raynaud’s syndrome before (A) and after (B) a 20 minute use of gloves. All tests were performed in normal temperature conditions (18 - 20°C) using a digital thermal imaging system (Meditherm Inc). This report highlights that FIR radiation has positive molecular effects in diminishing the synthesis of reactive oxygen species. FIR radiation produced by bio-ceramic coated materials (Nanobionic®) has been proven effective in vivo in both healthy volunteers as well as in pathological situations of decreased local blood circulation with diminished tissue perfusion that are present in Raynaud’s disease. There is an emerging evidence of positive effects on human health by the usage of FIR. For instance, FIR therapy has been applied for cardiovascular, autoimmune and other chronic health problems, arterio-venous fistula maturation, or on psychological stress-conditioned elevated heart rate, blood pressure and oxidative stress-suppressed cardiac contractility. Most of these conditions relate to the production of free radicals who are produced in trillions daily within the human body. Intracellular mechanisms prevent their toxic effects, but this system has an impaired function with age. In severe cases, free radicals can result in organ failure and the development of various diseases such as obesity and diabetes. Moreover, free radicals are linked to numerous pathological conditions, including cardiovascular disease and ischemia, cancer, inflammation, neurodegenerative diseases as well as many autoimmune diseases like rheumatoid arthritis, multiple sclerosis and systemic lupus erythematosus[19,20]. These processes can be positively influenced by several natural antioxidants. Our previous work has identified many natural compounds, like oleuropein and quercetin[22,23], that apart from their documented anti-oxidant properties, they also activate the major cellular proteolytic machinery, the proteasome, and importantly, they increase lifespan. Usually, these anti-oxidants are delivered orally as “food supplements”. Similarly, the pathophysiology of Raynaud’s disease is possibly associated with the oxidative stress, a fact that may open new therapeutic options. Repeated episodes of ischemia and post-ischemic reperfusion during Raynaud’s phenomenon vasospastic attacks favor the hypothesis that endothelial damage is aggravated by a release of oxygen-free radicals and ROS. Interestingly, Raynaud’s phenomenon is also characterized by reduced antioxidant potential. For this reason antioxidant therapy may be a new promising strategy against Raynaud’s disease. For instance, treatment with iloprost, a synthetic stable prostacyclin derivate, improves Raynaud’s disease in relation with normalization of antioxidant activity of vascular endothelium. Antioxidant compounds like N-acetylcysteine[27,28] and probucol also ameliorate Raynaud’s disease symptoms. These findings support the notion that usage of factors that reduce free radicals could be beneficial in the symptomatology of Raynaud’s disease. This report indicates for the first time that wearing a vest that is based on polyurethane loaded with mineral oxides (bio-ceramic) coated on a microfiber fabric may significantly contribute to the reduction of free radicals to both healthy volunteers as well as to patients suffering from free radicals related-disorders. The described work was supported by research grants of Nanobionic® to MP, MT and ESG. 1. Vatansever, F., Hamblin, M.R. Far infrared radiation (FIR): its biological effects and medical applications. (2012) Photonics Lasers Med 4: 255-266. 2. Beever, R. Far-infrared saunas for treatment of cardiovascular risk factors: summary of published evidence. (2009) Can Fam Physician 55(7): 691-696. 3. Leung, T.K., Lin, Y.S., Lee, C.M., et al. Direct and Indirect Effects of Ceramic Far Infrared Radiation on the Hydrogen Peroxide-scavenging Capacity and on Murine Macrophages under Oxidative Stress. (2011) J Med & Biologic Engineering 31(5): 345-351. 4. Jiang, F., Zhang, Y., Dusting, G.J. NADPH oxidase-mediated redox signaling: roles in cellular stress response, stress tolerance, and tissue repair. (2011) Pharmacol Rev 63(1): 218-242. 5. Kultz, D. Molecular and evolutionary basis of the cellular stress response. (2005) Annu Rev Physiol 67: 225-257. 6. Hohn, A., Jung, T., Grune, T. Pathophysiological importance of aggregated damaged proteins. (2014) Free Radic Biol Med 71: 70-89. 7. Senel Ayaz, H.G., Perets, A., Ayaz, H., et al. Textile-templated electrospun anisotropic scaffolds for regenerative cardiac tissue engineering. (2014) Biomaterials 35(30): 8540-8552. 8. Roussopoulos, E., Paradisis, G., Zacharogiannis, E., et al. Effects of Nanobionic Textile T-shirt on Maximal Anaerobic Power. (2012) Med Sci Sports Exerc 44: S676. 9. Hirata, M. Textile product US Patent 20110112461 A1. (2011). 10. Mehrizi, M.K., Mortazavi, S.M., Mallakpour, S., et al. The effect of nano- and micro-TiO2 particles on reflective behavior of printed cotton/nylon fabrics in vis/NIR Regions. (2012) Color Res Appl 37(3): 199-205. 11. Moreno-Villanueva, M., Pfeiffer, R., Sindlinger, T., et al. A modified and automated version of the 'Fluorimetric Detection of Alkaline DNA Unwinding' method to quantify formation and repair of DNA strand breaks. (2009) BMC Biotechnol 9: 39. 12. Maverakis, E., Patel, F., Kronenberg, D.G., et al. International consensus criteria for the diagnosis of Raynaud's phenomenon. (2014) J Autoimmun 48-49: 60-65. 13. Shui, S., Wang, X., Chiang, J.Y., et al. Far-infrared therapy for cardiovascular, autoimmune, and other chronic health problems: A systematic review. (2015) Exp Biol Med 240(10): 1257-1265. 14. Bashar, K., Healy, D., Browne, L.D., et al. Role of far infra-red therapy in dialysis arterio-venous fistula maturation and survival: systematic review and meta-analysis. (2014) PLoS One 9(8): e104931. 15. Leung, T.K., Chen, C.H., Tsai, S.Y., et al. Effects of far infrared rays irradiated from ceramic material (BIOCERAMIC) on psychological stress-conditioned elevated heart rate, blood pressure, and oxidative stress-suppressed cardiac contractility. 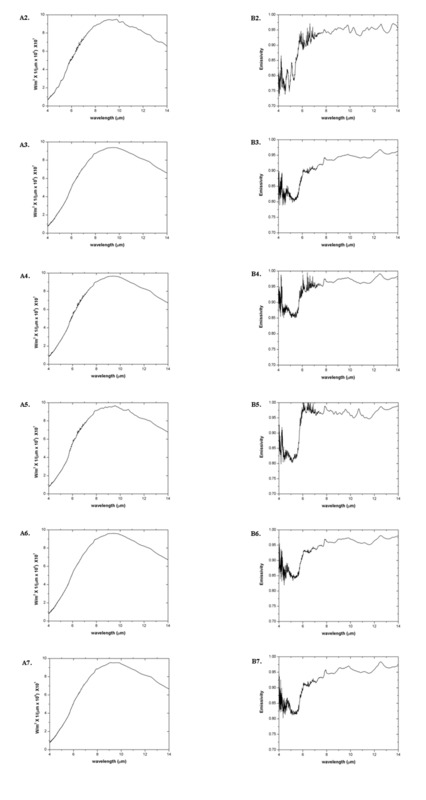 (2012) Chin J Physiol 55(5): 323-330. 16. Rizvi, S.I., Maurya, P.K. Alterations in antioxidant enzymes during aging in humans. (2007) Mol Biotechnol 37(1): 58-61. 17. Whaley-Connell, A., Sowers, J.R. Oxidative stress in the cardiorenal metabolic syndrome. (2012) Curr Hypertens Rep 14(4): 360-365. 18. Valko, M., Leibfritz, D., Moncol, J., et al. Free radicals and antioxidants in normal physiological functions and human disease. (2007) Int J Biochem Cell Biol 39: 44-84. 19. Ortiz, G.G., Pacheco-Moises, F.P., Bitzer-Quintero, O.K., et al. Immunology and oxidative stress in multiple sclerosis: clinical and basic approach. (2013) Clin Dev Immunol 2013: 708659. 20. Ryan, B.J., Nissim, A., Winyard, P.G. Oxidative post-translational modifications and their involvement in the pathogenesis of autoimmune diseases. (2014) Redox Biol 2: 715-724. 21. Wojcik, M., Burzynska-Pedziwiatr, I., Wozniak, L.A. A review of natural and synthetic antioxidants important for health and longevity. (2010) Curr Med Chem 17(28): 3262-3288. 22. Chondrogianni, N., Kapeta, S., Chinou, I., et al. Anti-ageing and rejuvenating effects of quercetin. (2010) Exp Gerontol 45(10): 763-771. 23. Katsiki, M., Chondrogianni, N., Chinou, I., et al. The olive constituent oleuropein exhibits proteasome stimulatory properties in vitro and confers life span extension of human embryonic fibroblasts. (2007) Rejuvenation Res 10(2): 157-172. 24. Chondrogianni, N., Petropoulos, I., Grimm, S., et al. Protein damage, repair and proteolysis. (2014) Mol Aspects Med 35: 1-71. 25. Balbir-Gurman, A., Braun-Moscovici, Y., Livshitz, V., et al. Antioxidant status after iloprost treatment in patients with Raynaud's phenomenon secondary to systemic sclerosis. (2007) Clin Rheumatol 26(9): 1517-1521. 26. Simonini, G., Pignone, A., Generini, S., et al. Emerging potentials for an antioxidant therapy as a new approach to the treatment of systemic sclerosis. (2000) Toxicology 155(1-3): 1-15. 27. Rosato, E., Borghese, F., Pisarri, S., et al. The treatment with N-acetylcysteine of Raynaud's phenomenon and ischemic ulcers therapy in sclerodermic patients: a prospective observational study of 50 patients. (2009) Clin Rheumatol 28(12): 1379-1384. 28. Salsano, F., Letizia, C., Proietti, M., et al. Significant changes of peripheral perfusion and plasma adrenomedullin levels in N-acetylcysteine long term treatment of patients with sclerodermic Raynauds phenomenon. (2005) Int J Immunopathol Pharmacol 18(4): 761-770. 29. Denton, C.P., Bunce, T.D., Dorado, M.B., et al. Probucol improves symptoms and reduces lipoprotein oxidation susceptibility in patients with Raynaud's phenomenon. (1999) Rheumatology (Oxford) 38(4): 309-315.